I would like to put a jotform on my wordpress page. The jotform widget does not work!!!. On a WordPress "Add New Post" page, click on "HTML" tab above post textarea. Copy form code above: Paste it into the HTML textarea. Make sure that you click on the HTML tab before pasting anything, else the browser will just show the embed codes and not interpret it. 1) Once you've finished and saved your form, click the "Setup & Embed" tab above the form builder. 3) Click Wordpress and follow the instructions that will be displayed. Hope the above instruction will work for you. Please let us know if you need further assistance. I am following the instructions above and when I update my wordpress blog, the html disappears and nothing shows up on my blog. Please help! Wordpress automatically deletes anything that could be used for viruses which is why they don't like those pesky iframe or script commands. But here is the work around for wordpress. Download and install iframe embed plugin for wordpress. 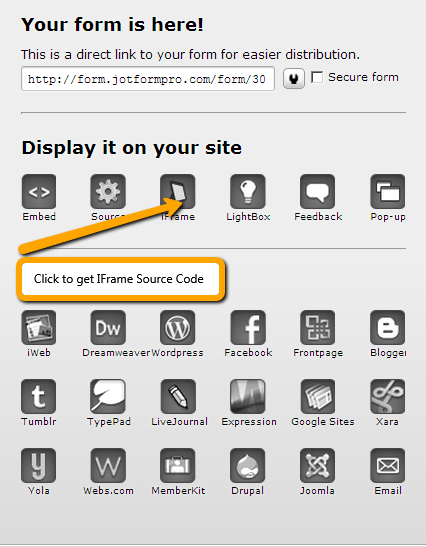 Then use the iframe code from jotform. Just copy and paste the code to your post or page, delete the extra stuff and format it correctly and you're done. That's it. Works great when you need to stick Google maps or calendars in your wordpress as well. 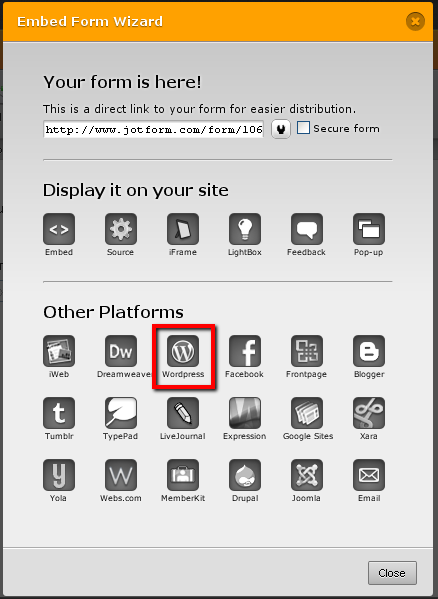 If your blog is hosted on Wordpress.com, then there is no way you could embed your form. Wordpress.com prohibits pasting of codes such as <script> <iframe> <embed> and any other tags which could possibly pose as a security threat to its community. Plugins are tools used to extend the functionality of the WordPress platform. However, they are only applicable to privately-hosted blogs and web sites using the WordPress.org software. Plugins are not permitted on WordPress.com for various security reasons. Yeah, what he said. I'm curious if Carrie is using wordpress.com or the platform. I just discovered jotform today and very excited about linking it to my wordpress websites. Most probably this wordpress blog is hosted in wordpress.com that's why it's not showing up the form. I have tried a number of ways to do this in a wordpress.com hosted blog but was not successful. What I can suggest to Carrie is that provide an external link going to the form instead. Hi, I would strongly suggest to try what Bryan suggested it should fix it and saves you the trouble on conflicting Wordpress plugins as some plugins interfere with embedded codes. Try the IFRAME approach instead and install the IFRAME embed plugin. Using what Bryan suggested, it does not matter if you are on HTML tab or Visual tab. Wordpress shortcode works on both of them. There are several iframe embedding plugin options - what specifically is the correct one to use ? Are you using Self Hosted WordPress or Hosted WordPress? When embedding the form using IFRAME, you do not need to use any plugin. In your WordPress website, switch your page/post text area from Visual to HTML Mode. If you need more assistance, please contact us again. I tried 2 differant IFrame plugins, tried wp code, iframe code, both in visual editor and text editor. after pasting code into page, the update button will not update. This last time, when I used the WP code, again, the update button would not update, - so I was able to go back to visual and update but the code did not stick...it does not show..it dissapeared. We would love to assist with your request - but we cannot respond on this thread. Please open a new support request with the same details so that we can effectively respond.